X always marks the spot. In your case, no one will think your buried treasure is resting on your teeth. Smart move Mister Pirate Man. 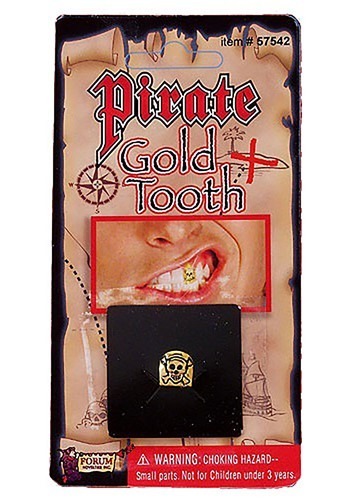 And don't forget you can always create a reputation as the most fearsome pirate on the seven seas with this Pirate Gold Tooth. That's right! No need to make that appointment with the busiest dentist in Tortuga, you can just get your own gold tooth right here! It attaches to your real tooth, and it even sports a skull and crossbones on it. Because when a pirate smiles the world should smile with them. Wait, did we say smile? We meant cower in fear. Either way, this gold tooth will look amazing with your pirate costume, matey.